Posted by Lionel on April 25, 2009. Breakdown: Jericho Jones hit for both power and average in his professional debut at Arizona. His .340 average was the second highest BA among all players in the Cubs organization, behind only Micah Hoffpauir. Among his 54 hits were 7 doubles, 6 triples and 5 HR's. The 6 triples were 6th in the organization, as was his OPS. So, you say, why is he only ranked 19th? Well, for starters, Jones struck out 41 times in 43 games, or in over 25% of his AB's, and only drew 10 walks. The former college pitcher and outfielder managed to amass 3 errors in his short time in left field, which translate to 11 over a full season. Finally, for 21 year old former collegian playing a full season in Arizona, he should be amassing these type of numbers. He obviously needs to work on his defense and improve his eye for the strike zone as he progresses. Posted by Lionel on April 24, 2009. Kevin Hart-Hart is closing for the I-Cubs and still trying to overcome his 5 earnie performance mentioned in last week's ATAtM. Last Friday, he struck out the side. He picked up his second save this week on Monday, a 2 inning save in which he yielded another run. He has an ERA of 8.53, but has struck out 10 in 6 and 1/3 innings. Bonus-Jake Fox may soon get the Micah Hoffpauir treatment, being placed permanently in ATAtM despite not being a top ten prospect (he's #24 according to BA). After earning Hitter of the Week honors last week, his hitting streak ended at 12 with back to back O'fers. Despite that, in 15 games, he has 7 HR's, 24 RBI's, and 15 runs. He's also struck out 18 times. His OPS has dropped to 1.374. Welington Castillo-Happy 22nd Birthday Welington. I wish I had something positive to report about your start at Tennessee for your birthday, but I don't. 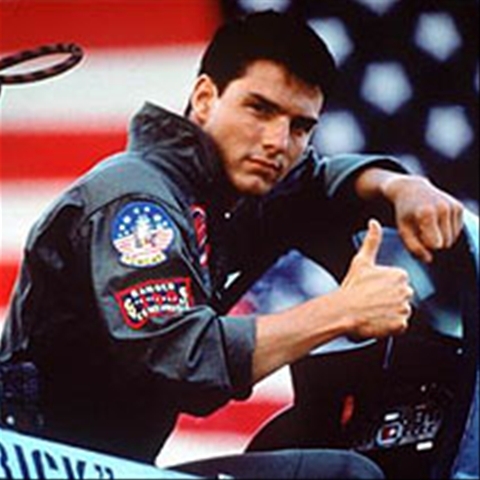 Castillo is 2 for 12 this week with 5 K's. So far this year, he's 0 for 11 with 5 K's against lefties. Cubs have a 3-4 record when Castillo starts behind the dish. Steve Clevenger-I'm still surprised the Cubs have Castillo and Clevenger on the same team, splitting the catching duties, but I guess I'll have to get over that. Clevenger's been the more offensive catcher for the Smokies so far. In 4 starts this week, he went 4 for 16 with an HR and 5 walks. He's hitting .320 on the year with a .433 OBP, and he's only K'd twice. Jay Jackson-Jackson was solid last Saturday, giving up 2 earned over 5 innings, giving up 4 hits and 2 walks while striking out 6. He took the loss, in large part to the 6 runs that were given up by Ryne Sandberg's bullpen after Jackson left the game. He is slated to toe the bump tonight. Bonus-Casey Coleman, a 15th round pick last year, has dominated so far this year. In his 3 starts, he's 3-0 with a 1.50 ERA. In 18 innings, he's K'd 15 and walked only 5. Not only is that a good K/W ratio, but I'm impressed he's averaging 6 innings a start. Righties are batting .195 off him. Tyler Colvin-I forgot to mention the caveat on Colvin...he's still recovering from offseason shoulder surgery and isn't 100%. So that's why he's in Daytona and that's why he was hitting .182 as of the last ATAtM. But a 6 game hitting streak has seen his BA rise to .311. For the week, he was 10 of 23 with his first HR of the year. His OBP is now .446. I think he'll remain at Daytona until the weather warms up for good in Tennessee. Starlin Castro-While Colvin was heading up, Castro was heading in the opposite direction. His .304 BA is now .233 after a 3 for 20 week. He had a run and 4 K's, but other than that, his score sheet was empty. It will be interesting with the SS logjam whether the Cubs move these guys up or down based on performance or prefer to keep them with their respective teams. Bonus-Coming off a winter where he won defensive player of the year in the Hawaiian winter league, Marquez Smith is using his bat to impress. Before an 0 for 5 last night, the 3-sack had a 10 game hitting streak and a 7 game RBI streak. For the season, he's hitting .282 with 4 HR's and 16 RBI's. Josh Vitters-Vitters has hit in 8 of the 10 games he played in this year, batting .378. Last Saturday, he went 3 for 4 with a single, double and triple, scoring twice and driving in two. But those are the only two extra base hits he amassed in his 14 hits. Vitters already has 3 errors. Ryan Flaherty-Flaherty was 2 of 11 this week, but his BA is still .324. He has as many K's (6) as walks, giving him an OBP .425. While his down week dropped his OPS below 1, it's still at .954. He has 2 errors in 12 games. 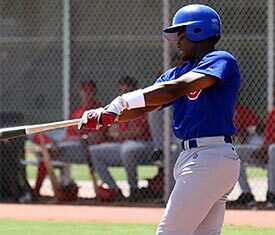 Bonus-The Cubs #14 prospect, Junior Lake, is yet another SS prospect in the Cubs system. However, due to the logjam, he has been playing some 2-sack at Peoria to start the season. The 19 year old is off to a rough start...4 hits in 33 AB's, although 3 of them went for doubles. He's also K'd 14 times and he's already racked up 6 errors in 11 games. No news on Hak-Ju Lee, Andrew Cashner, or Dae Eun Rhee. Breakdown: The first thing that I'm sure jumps out for most people is how a guy with a 3.72 ERA is in the Top 20 pitchers. And it wouldn't help to say that his ERA was actually 4.76 at Aberdeen and was only saved by throwing 6 and 1/3 scoreless at Delmarva. But, if you look past his inflated ERA, Henry Williamson threw up some spectacular numbers. He struck out nearly a batter and a half per inning (third best in the organization) and only walked 5 guys in 20 appearances. That gives him a K/W ratio of 8.40, tops among all pitchers in the Cubs farm system. He gave up a few long balls (3) which doesn't sound like a lot until you factor in he didn't throw 30 innings. If he can repeat these numbers against more advanced competition and over a longer season, Cubs fans could be a little less disappointed with the Pie trade. Posted by Lionel on April 23, 2009. Before free agency began, it looked like Marmol would close, Jeff ND would be the setup guy, with Gaudin, Cotts, Wuertz and possibly Marshall in the 'pen, with one open spot for Guzman, Ascanio, Hart, etc. to try to grab (with Guzman the clubhouse leader given his status as out of options). The first move JH made was to acquire Kevin Gregg. Alright, move Jeff ND into the 7th spot, Marmol and Gregg battle for 8th and 9th duties, and eliminate the open 'pen spot. Then the Cubs traded cash for Rule V Pick David Patton. Fine. He can come in, try but not win a big league spot, no big deal. All this time, though, there were discussions as to whether the Cubs would tender a contract to Gaudin, who was due around $2M. This surprised me a little, because I thought Gaudin was OK and he'd be better when he was fully healthy this year. They tendered him for $2M. Then comes trade/payroll dump central. DeRo is the first to go, but the Cubs get Jeff Stevens in return, and we're told he's MLB ready and could compete. A week later, Marquis gets traded for the Rockies trash, Luis Vizcaino. While the addition of Vizcaino makes the bullpen over-capacity, the now-open starter spot makes it a wash. Two weeks after that, Felix Pie is dumped for a couple of pitchers, including Garrett Olson, who were told is MLB ready and could compete. Most of us believe that he's really being added to trade for Jake Peavy. 10 days later, Olson is traded, but instead of getting Peavy, the Cubs get Aaron Heilman. We are told he'll compete with Marshall, Gaudin, and Jeff ND for the 5th starter's spot, and based on the length of time that's passed since the Peavy discussions were serious, it looks like that'll happen. Heilman makes the bullpen officially +1. To make that +1 disappear, the Cubs trade Michael Wuertz, who was out of options. But even then, you still had Angel Guzman who you were going to lose. And when Guzman and David Patton pitched well in the spring? That meant someone had to go (Gaudin) and Jeff ND had to be sent down. But it still handcuffed the Cubs. There wasn't a single member of the 'pen who could be sent to the minors without clearing waivers. I'm all for building a strong bullpen, but JH really screwed around too much. I think you should always have the ability to send down one or two of your relievers. The Cubs can do that now, but at a cost of $6M. And if they aren't able to trade Vizcaino, the Cubs traded a serviceable Jason Marquis for nothing but a $4M dollar expense. Posted by Lionel on April 19, 2009. Breakdown: When he was drafted in the 3rd round of 2007, the knock on Thomas was that he was an all-stick, no glove guy. In an effort to prove them wrong, he focused on his defense a little too much in 2008. 6 errors in 113 games lead to a .989 fielding percentage (leading the league among 2-sacks), but his BA dropped 40 points from '07 and he K'd in over 25% of his AB's. But you still have to like his 30 doubles and 22 stolen bases, showing that when he did get on, he usually got himself into socring position. In fact, using a stat that I just made up and assuming he only stole second base the 22 times, he would've put himself in scoring position (or scored himself on an HR) over 41% of the time he got on base. He excelled in Daytona's postseason, earning postseason MVP honors. If Thomas can cut down on the K's and improve the BA this season, while continuing the glovework from last year, he could be back among the best prospects the Cubs have.